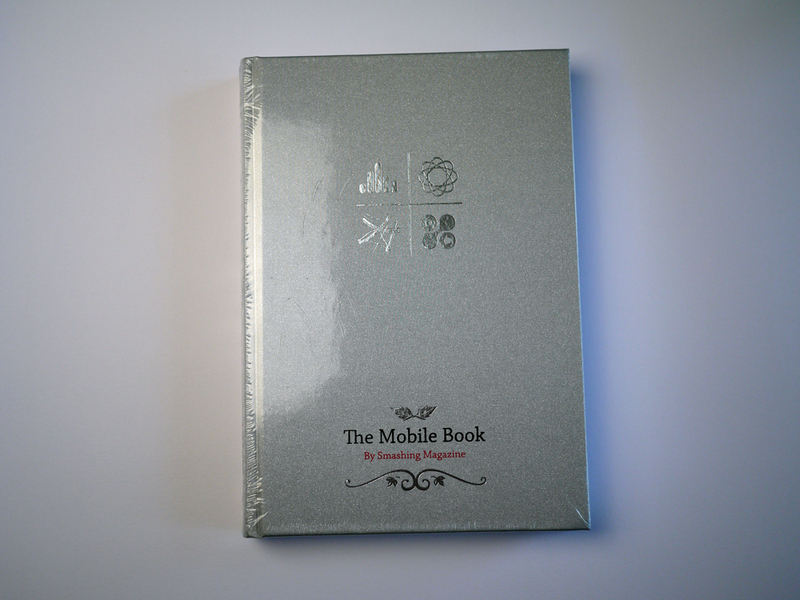 Yes, our brand new Smashing Mobile Book has finally arrived, and it has almost reached your doorstep! If you’ve already pre-ordered the book weeks ago, then it’s really only a matter of days! Until then, the complimentary digital version is waiting for you in your Smashing Shop dashboard. And if you haven’t ordered just yet, make sure to get the book now! At this very moment, all pre-orders are being shipped from Berlin, Germany, by airmail. Due to an unexpected huge amount of pre-orders in the past days, delivery of the new book orders will take a bit longer since we only have a limited amount of printed books in pre-sale stock. 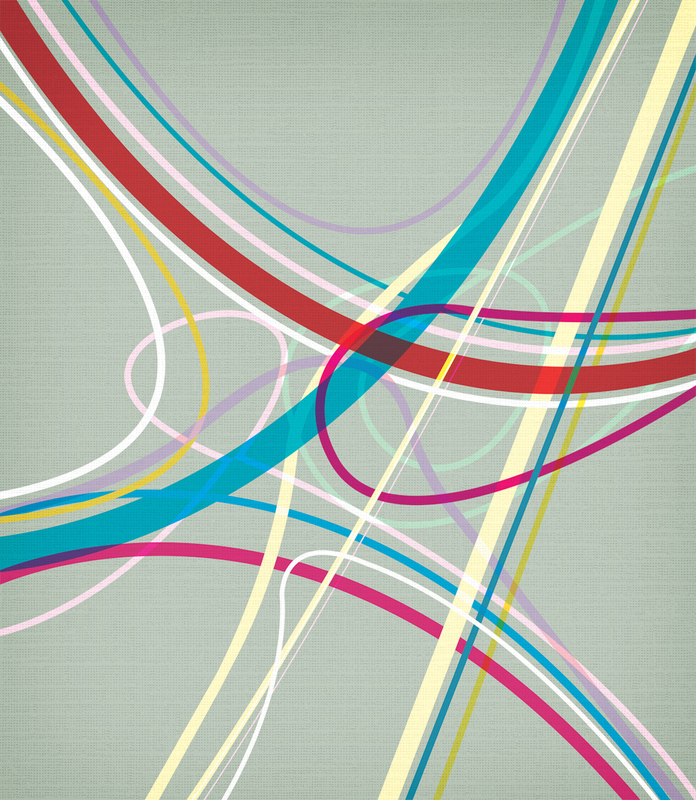 When it comes to mobile, there are more open questions than definitive answers. Due to its fragmentation, it’s not so easy to understand how the mobile market looks and works in general. 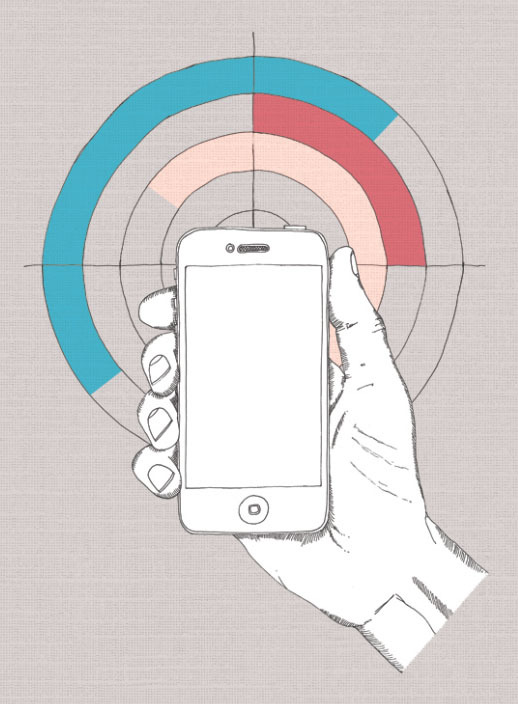 How can you pick the right mobile strategy and select the right approach for your website? What design patterns and what UX techniques can assist you to design faster and more effectively for mobile devices? What design patterns do you need to be aware of when building responsive websites and what patterns will help you optimize the performance for mobile? When you design with mobile in mind, how exactly should your design process differ from a traditional design workflow? Our new book attempts to answer these questions. Well-known experts such as Peter-Paul Koch, Stephanie Rieger, Trent Walton, Brad Frost, Dave Olsen, Josh Clark and Remy Sharp have contributed to the book to present the most relevant and valuable insights. 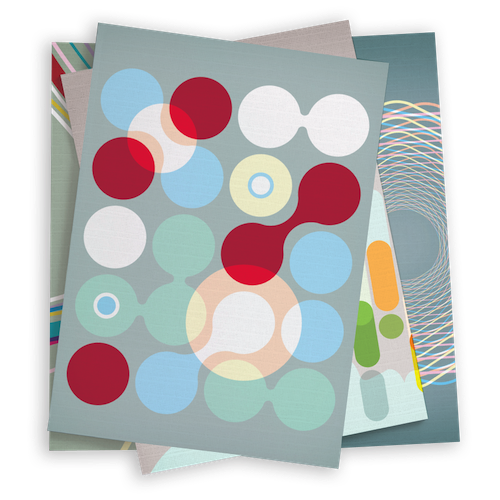 To ensure the quality of the material, the chapters have been reviewed by Scott Jenson, Bryan Rieger, Tim Kadlec, Bruce Lawson and other active members of the mobile design community. The foreword was written by Jeremy Keith. It wasn’t easy to bring together such a stellar line-up of experts, but a compromise wasn’t an option. 320 pages, 16.5 × 24.0 cm (6.5 × 9.5 inches). For both newcomers and experienced Web designers and developers. Shipped from Berlin, Germany, only via air mail. The mobile environment is a new major challenge, but also a great opportunity. In our upcoming Mobile Book, 12 brand new chapters from experts on mobile summarize the knowledge and best practices in mobile design and development to prepare you, dear reader, for the challenges of the mobile future. The traffic coming from mobile devices is steadily increasing and has become significant in marketing. It’s time that we learn how to address these pressing issues — how to develop the best solutions for our clients so they don’t lose traffic, gain better brand awareness, find new customers and be prepared for the unpredictability of the mobile environment in the future. If there is a book that every Web designer and developer needs today, then it is surely this one. Our new Mobile Book is available as a printed book, single eBook and as an Mobile eBook Bundle. The first and the last options include the brand new Smashing Mobile Bundle — four extra eBooks that contain the best articles on mobile on Smashing Magazine. You will receive them right away after the purchase. When setting up the concept of the book, we worked hard to ensure a delicate balance between basic knowledge and the current state of the art. Please note that changes to chapter titles are still possible. 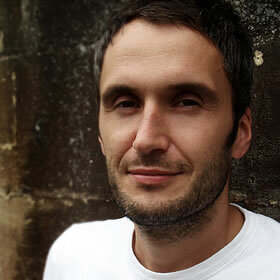 Jeremy Keith has been around on the Web for a while and saw the emerging mobile medium from its earliest days. With his preface for the Mobile Book, Jeremy introduces us to this new facet of the Web and the new possibilities and challenges that the Mobile industry produces as a relatively young medium. Peter-Paul Koch What’s Going on in Mobile? This chapter provides a general overview of what’s going in the mobile industry today, who are its main players and how they influence each other. From a technical perspective, the chapter reviews the peculiarities of mobile networks and platforms, existing mobile browsers and guidelines for testing websites on mobile. You’ll understand the mobile market, how it works, what it involves and how it affects our daily work. Chapter keywords: mobile value chain, operators, device vendors, fragmentation, Android, iPhone, Windows Phone, OS vendors, proxy browsers, open device lab, mobile network. This chapter provides a glimpse of where the future of mobile might lead, and what technologies will lead us there. These include new low-power computer chips, new display technologies, new APIs and the growing penetration of near field communication (NFC). But more important than the technologies themselves is how they will need to work together, enabling new and exciting ways to do business, to connect with friends and family and to interact with the world around us. Chapter keywords: connected devices, TVs, consumer customization, display technologies, RFID, NFC, Device APIs. The main components of Responsive Web Design(RWD) — flexible grids, flexible images, and media queries — are just the tip of the iceberg. And with the ever-increasing number of devices flooding the market, RWD is the most effective way to address them all at once. This chapter by Trent Walton features strategies, techniques and design workflow tips on building effective and bulletproof responsive designs. Chapter keywords: image aspect ratios, resolution independence, breakpoints organization, vertical and em-based media queries, content choreography, image hierarchy, fluid type. As Responsive Design continues to evolve, we’re confronted with difficult problems about how to create adaptive interfaces that look and function beautifully across many screen sizes and environments. E.g. how do we handle navigation that’s four levels deep? This chapter features emerging responsive design patterns and explains how to use them meaningfully in your projects. Brad Frost provides useful tips and expert advice on various design elements covering everything from complex navigation to advanced data tables. Chapter keywords: style guides, layout, navigation, conditional loading, progressive disclosure, background images, icons, maps, type, carousels, accordions, forms, tables. Although Responsive design per se has provided a great fundamental concept for designing mobile-optimized websites, the core ideas that make up these concepts pre-date the mobile revolution. In this chapter, Dave Olsen reviews what it takes to optimize mobile experiences in terms of performance. How do we keep responsive websites lightweight? What do we need to know about caching, lazy loading, latency? How can we start using RESS? Device detection or feature detection? Also, how do we develop and test our websites for performance? This chapter answers all these questions and more. Chapter keywords: mobile performance, latency, localStorage, lazy loading, Data URI scheme, JS frameworks, RESS, browser detection, feature detection. 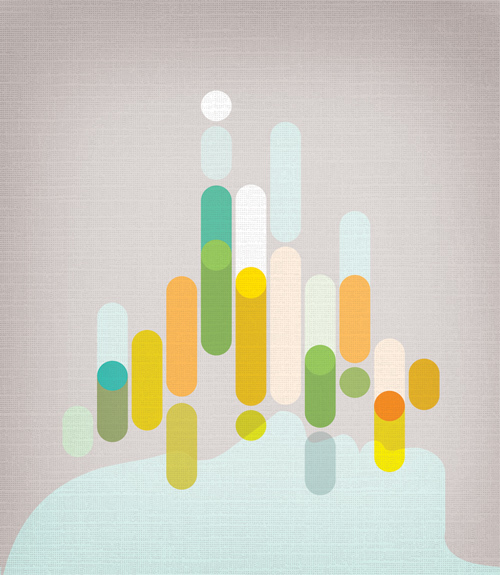 Mobile requires us to rethink the way we create, develop and build experiences for our users. In this chapter, you’ll look at some of the more glaring pitfalls to conventional processes, specifically as they pertain to how we design—and how we communicate design—for an increasingly mobile-accessed Web. You’ll learn about implementing and selling processes that support a realistic understanding of what it means to design with mobile in mind. Chapter keywords: psychology, contextual interviews, collaborative design workshops, design studio methods, sketching, wireframing, convergent prototyping. Among the many new opportunities of the mobile medium are the capabilities of mobile devices. One of the major interaction changes, however, involves gestures and touch. In this chapter, Josh Clark explains how we can use them to improve the mobile user experience and provides concrete examples of implementations in real-life applications. From left to right: Jeremy Keith, Peter-Paul Koch, Stephanie Rieger, Trent Walton, Brad Frost, Dave Olsen, Dennis Kardys and Josh Clark. The book is currently being finished, yet we don’t know whether all chapters will fit into the printed book. However, the remaining chapters will be offered as an extra document that will be available to download along with the digital version of the book. The key to using design patterns is not to get caught up in copying the exact implementations, but instead to witness the underlying reasons for why something works, and then adopt a unique design situation with authenticity, grace and vision. This chapter attempts to collect strategic patterns that reflect the underlying customer experience trends unique to the mobile environment, and use examples of particular implementations that call out important existing or emerging trends. Chapter keywords: faceted refinement, parallel search, zero results recovery, tap-ahead, engagement, rollaway dashboard menu, tabbed views, reading and pagination. As an experienced designer of iPhone and iPad applications, Nathan Barry takes us on a detailed journey through the iOS platform. Starting with general culture and language of iOS, he moves to iOS design patterns, technical implementations in Xcode, the design and development process for new iOS apps as well as pricing, marketing and submission guidelines. Each section is accompanied with examples, suggestions and best practices. If you’ve had some experience with debugging in mobile browsers, you’ll know that debugging in IE6 back in the day was easy. In this chapter, Remy Sharp explains the technical workflow for developing, testing and debugging your Web applications on mobile devices. The chapter focuses on how to reduce the edit-refresh-test cycle and how to get inside these devices to debug. Chapter keywords: mobile testing, debugging tools, open device lab, Android, Opera Mobile, Firefox for Android, simulators. As an experienced designer of Android apps, Sebastiaan de With provides a detailed insight into the Android platform, its peculiarities, the difficulties caused by fragmentation of the Android OS as well the developing and submission process for Android apps. With its new Windows design language, Microsoft created an entirely new design methodology focused on the content of applications, relying more on type and less on graphics. In this chapter, Arturo Toledo, former UX designer at Microsoft, explains the new design concepts such Hub & Spoke model, Panoramas, Pivots and Pages, reviews Windows Phone design grid and design guidelines, provides UX advice on when what model is most appropriate and presents a workflow from the ideation phase to the design and development phase of a Windows phone app. Chapter keywords: sketching, flow, hub & spoke model, panoramas, pages, list views, design grid, app bar, animations, branding. From left to right: Greg Nudelman, Rian van der Merwe, Nathan Barry, Remy Sharp, Sebastiaan de With and Arturo Toledo. In discussions about user experience on mobile, we tend to make general assumptions about the environment in which users will be using an app or a website on their mobile device. However, mobile context is a myth. We can’t make any realistic assumptions about the context because we just don’t know anything definite about it — when and how the device is used or what connectivity it currently has. Obviously we can plan for different scenarios — and so we should — but mobile context is often as unpredictable as particle physics. We just don’t know for sure when mobile devices are being used – on-the-go, in the kitchen, or when watching TV. In the first chapter of the book, Peter-Paul Koch and Stephanie Rieger explore the mechanics of the mobile world and the ongoing developments in the industry. 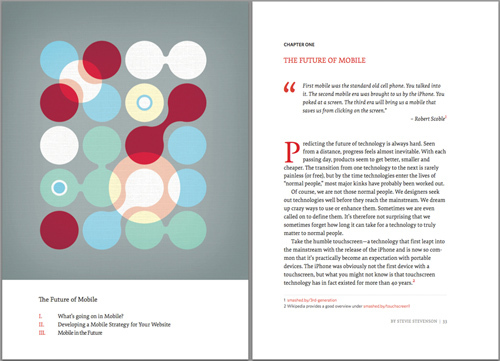 The first chapter of our new "Mobile Book" describes the mobile landscape and provides insights about the future of mobile. As a result of random assumptions, we tend to think that mobile experiences should be the “light” versions of traditional “desktop” experiences — because well, that’s what users need. However, research shows that 80% of users want to have all “desktop” features on mobile — they want to be able to use the features everywhere, and in a similar way. That’s when meaningful, performance-optimized responsive design solutions become important. In the second chapter, Trent Walton introduces strategies for developing responsive websites, Brad Frost discusses emerging responsive design patterns and Dave Olsen explains what you need to know to optimize the performance of mobile websites. The second chapter explains the strategies, design patterns and optimization techniques for Responsive Web design. Whether you are designing a mobile-optimized website or a native app, you will have to use emerging design patterns and techniques that wouldn’t work on desktop. The mindset shift affects not only layout, but general interaction paradigms, especially since mobile devices are actually “smartphones”, with capabilities that can’t be used in a similar way on desktop devices — e.g. gestures, touch, accelerometer, gyroscope etc. Users want to have access to information and functionality, and they want the content to be usable — wherever they use it. It’s our task to make it work, using emerging UX design patterns. 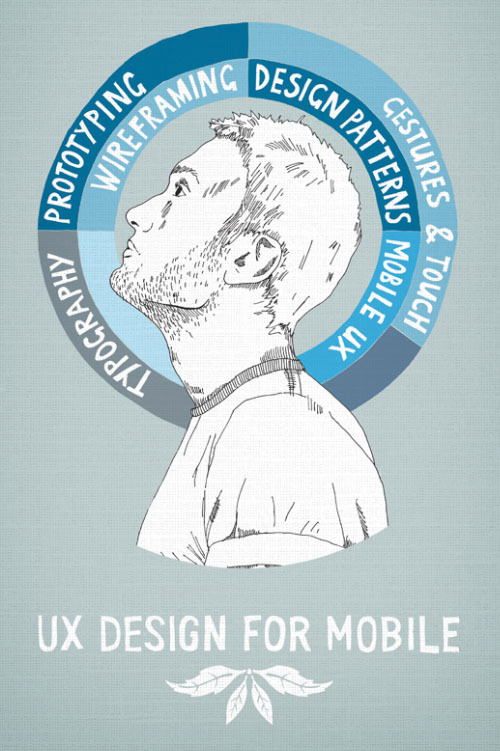 In the third chapter, Dennis Kardys explores the wireframing and prototyping process for mobile, Greg Nudelman and Rian van der Merwe explores mobile design patterns and Josh Clark explains how we can utilize gestures and touch meaningfully on mobile. The third chapter explores the implications of the mobile medium for UX design process and mobile UX design patterns. When it comes to desktop browsers, we are used to obvious big players and traditional platforms Mac, Windows, Linux. The mobile world is entirely different, and the platforms are very different — they have a different culture and a different design language. In these extras of the book, you’ll look closely at the various mobile platforms — iOS, Android, Windows Mobile as well as the Web itself (HTML5 Apps). 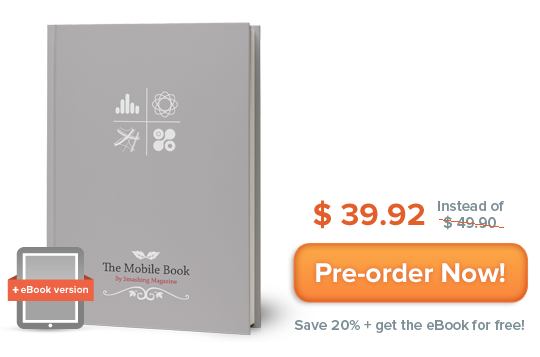 The last chapter provides insights into the mobile platforms: iOS, Android, Windows Mobile as well as HTML5 Apps. The Mobile Book consists of 320 pages sized at 165×240 mm (6,5 x 9,45”). It’s a damn real hardcover with a luminous red bookmark and stitched binding. The minimalist cover is coated with original gray fabric and has a shiny metal imprint. It’s printed on sophisticated 130/gram paper. Of course, the printed book comes with a portable companion — an eBook edition that you get for free along with the printed book. After three successful “Smashing Books”, we wanted to do something entirely different this time — something that does not look like yet another item of our series (which in fact is coming in spring 2013). And so we did. 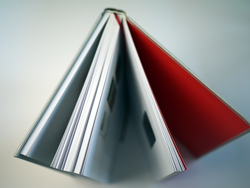 If you prefer to have a printed book, you want it to be a beautiful, honest, classic book. We wanted to achieve a high contrast between the modern content of today, but with that cozy little feeling from the good ol’ times. So we went to great efforts to create something unique, memorable and valuable. A book with a classic, conservative look and feel, a book in the best sense of its kind - that is guaranteed to look good on a desk or on a bookshelf. The chapters of the book are illustrated by talented, well-respected UK-based designer and illustrator Mike Kus who is known for his artistic, vivid and memorable artwork. 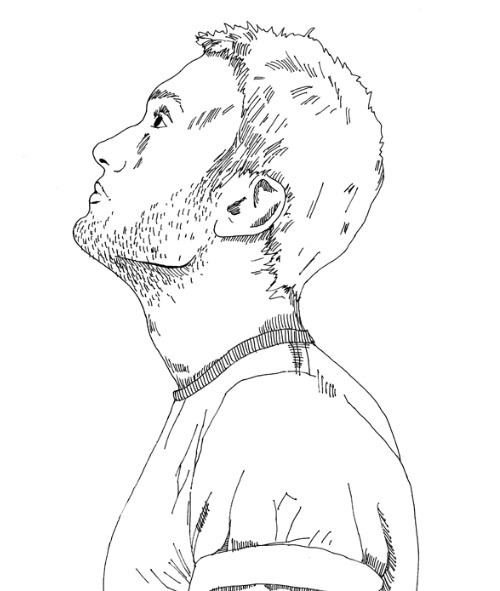 We’ve asked him to create abstract, minimalistic illustrations that will fit nicely within the concept of the traditional, classic book layout. After a couple of iterations, Mike knew exactly how he wanted the illustrations to be, so the design process didn’t take as much time as we thought. It was an open brief, so I wanted to do something interesting. I didn’t want to go down the route of illustrating mobile phones and computer screens etc. It felt too obvious. 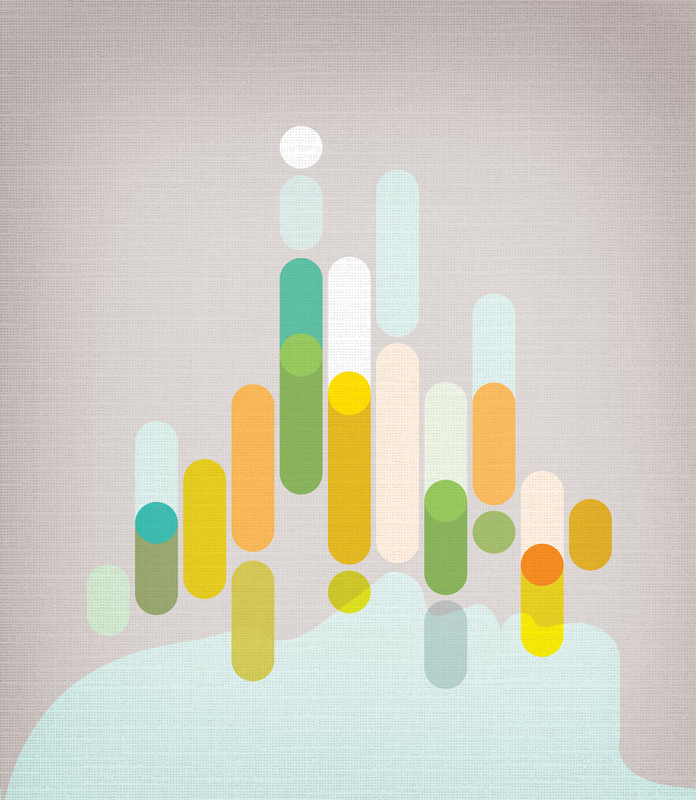 Instead I opted for an abstract approach. Based on the section titles of the book, I created a visual representation of the titles. 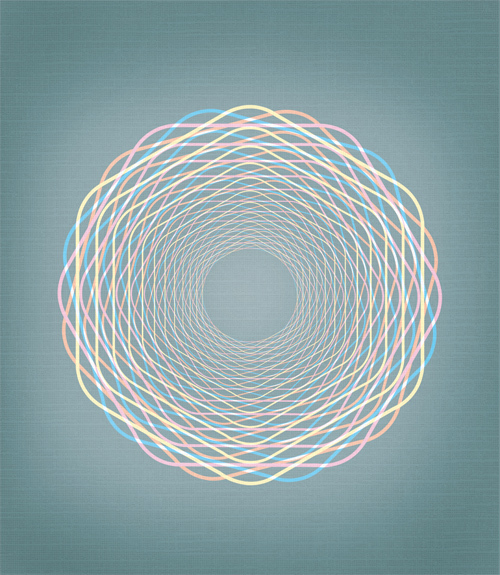 For example, for the title ‘Responsive Web Design’ I created an illustration that shows circles based on a grid that are overlapping and morphing into each other. This is represent the fluid and reactive nature of ‘Responsive Web Design’. For the ‘Mobile Platforms’ section my idea came from the overlapping highways on a spaghetti junction. 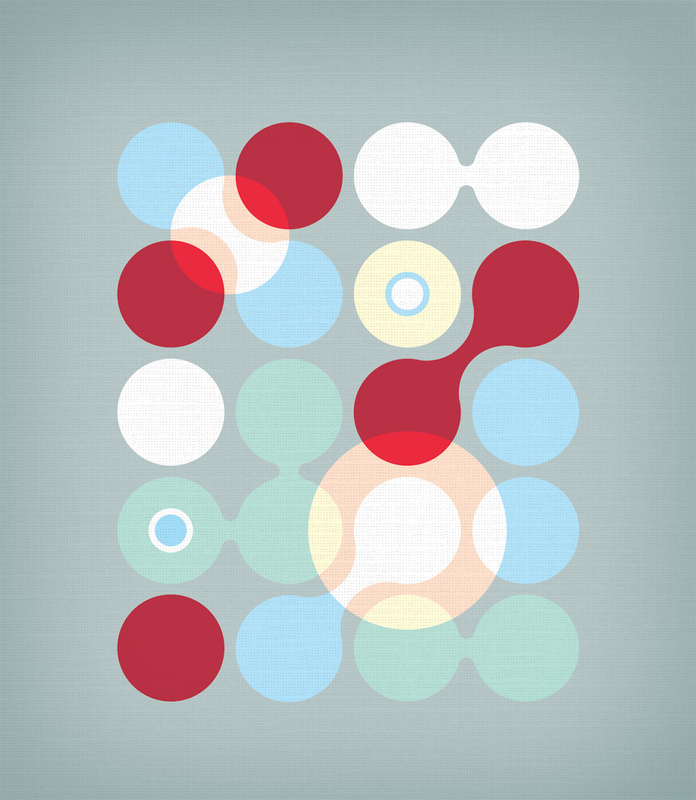 This is to represent the the complexity of developing for multiple platforms and mobile browsers. For the cover of the book I created four icons, which are essentially simplified versions of my illustrations. Mike Kus' early sketches for Smashing Magazine's Mobile Book. We wanted to create a simple cover design, so Mike has designed four icons, which are essentially simplified versions of his illustrations. The cover is coated with original gray fabric and has a shiny metal imprint for the icons. Initially, we wanted to cover all popular mobile topics within the printed book, but because some chapters took more time to write and review than planned, we decided to release them in an addendum to the printed book. All buyers of the Mobile Book will get the Addendum for free in January 2013. The eBook will provide insights into design and development for iOS, Android, Windows Phone, as well as introduce developing and debugging techniques for advanced HTML5 Web applications and explore UX patterns on these platforms. The shipping cost for one book or a bundle is $5 — wherever you are in the world. We ship everywhere worldwide. We are paying a share of the shipping costs ourselves to make it possible for anyone to purchase the book. Our prices are transparent: we don’t have any hidden costs, and we won’t confuse you with tricky calculations. What you see is what you pay! All books will be shipped via air mail to keep delivery times as short as possible. You can find the anticipated delivery time for your country in the delivery times overview. Please note that we will start to ship the books early-mid December 2012. Is the Mobile Book available as an eBook? Yes, the book will be available in PDF, EPUB and Kindle (Mobipocket) formats, and you can pre-order the eBook bundle now. Is “Mobile Book” the “Smashing Book #4”? 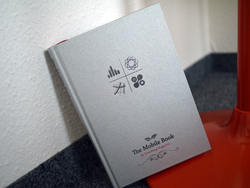 No, “The Mobile Book” is a new series that we are starting here at Smashing Magazine. 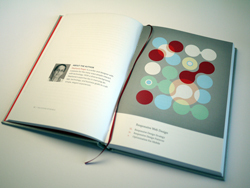 It is not Smashing Book #4 — it has a different design, layout and concept than other Smashing books. However, the Smashing Book #4 will be published in May 2013 — please stay tuned! Thank you for your support, everybody—we truly appreciate it. And we hope that you’ll love the Mobile Book just as much as we do!